← Video: Hell Yeah, Boston Red Sox Pitchers Like Beer! I believe I’ve found my Halloween costume. The Memphis Redbirds will be wearing some freaky uniforms in a couple of weeks for a good cause. 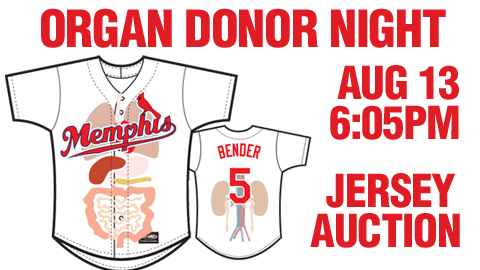 On Saturday August 13, the St. Louis Cardinals Triple-A affiliate will host Organ Donor Night at AutoZone Park in Memphis. The Redbirds have teamed with the National Foundation for Transplants to encourage fans to sign up to be an organ donor. Those who sign up or show their driver’s license that they are already a donor will be entered to win prizes including a team autographed jersey. Additionally, a silent auction will take place during the game on the concourse for fans to bid on the jerseys. For more information, read the Redbirds press release. I can’t wait to see how the players look in these unis. This entry was posted in Minor League Baseball, Promotions, St. Louis Cardinals, Strange and tagged AutoZone Park, Baseball, Memphis Redbirds, Minor League Baseball, Organ donation, Organ transplantation, St. Louis Cardinals, Triple-A (baseball). Bookmark the permalink.